I had my first little hypnobub (third baby)!! My entire birth was amazing and the first time I went into spontaneous labour too! During labour, I used the breathing techniques, flopping/staying relaxed during surges and kept my positive affirmations going to keep focused. I had a little gas during transition but that was it. Bub was born in the water like my first two births but this one was so much less intense and I actually wanted to do it all over again as soon as he was born!!!! I also felt amazing after delivery. 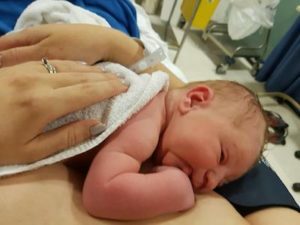 I had little discomfort and didn’t need any pain relief which I again put down to feeling so relaxed during birthing and not tensing my muscles! I also want to mention that immediately after my son was born my amazing midwife simply stated “Beautiful! That is how you birth!”). That will stay with me forever…. My baby was also extremely alert and quiet and slept for 8 hrs…..So thank you. This was the birth I needed. Now to convince hubby to do it all again!!! !